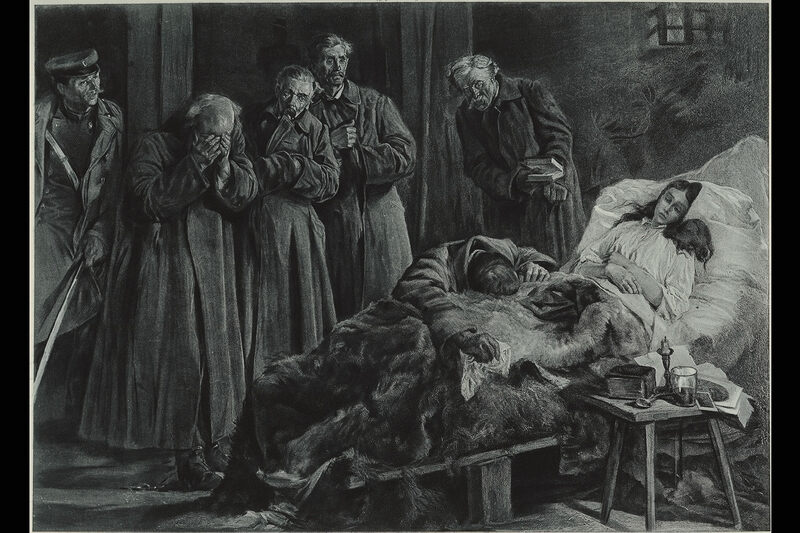 "The horrors of Siberia fortunately do not often invade the domains of art, and even in this important and serious work, by a Polish painter, the mournfulness of the exile's death-chamber is not unduly accentuated. Her bed is the rudest, her apartment is cold and bare, and the Russian officials look irreverently in at the door, but we may well conceive that the very forlorness of the life thus left behind may serve in a measure to temper the grief of the mourners. In his rendering of this sombre scene the painter has well preserved the subdued tone of his theme, - only the despairing outburst of the friend who throws himself face downwards on the couch furnishes the sharp accent to complete the composition. The technical execution of this painting betrays the artist's ability, the brush work is vigorous and knowing, full of color and yet always kept within due bounds."